Figure 1. This seventh-century Babylonian tablet is a calendar listing the lucky and unlucky days of the year, Cuneiform was originally inscribed on clay with a specially cut reed stylus. Figure 2. 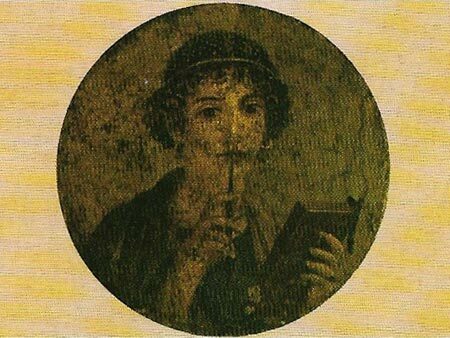 This wall painting from Pompeii (first century AD) represents a lady holding wooden tablets and a stylus. The tablets were covered with wax, then incised with a sharp-pointed stylus and finally all bound together. The codex form, which at about this time began to replace the roll for works written on papyrus and parchment and which resembles the pages of a modern book, may have developed from this. Figure 3. The finding of the Dead Sea Scrolls in the Qumran area since the 1940s has aroused considerable interest, principally because of the close relationship between the language and the ideas to be found in the scrolls and those in the New Testament. It is now accepted that the scrolls antedate the Christian era and that they belonged to a sect of Essenes. Many of them contain books of the Old Testament, others regulate the sectarian discipline of Essenes. A few are written on papyrus but most are written on leather and nearly always in the Hebrew language. Figure 4. The papyrus roll was the usual writing material in the early Mediterranean are for 4,000 years. Figure 5. 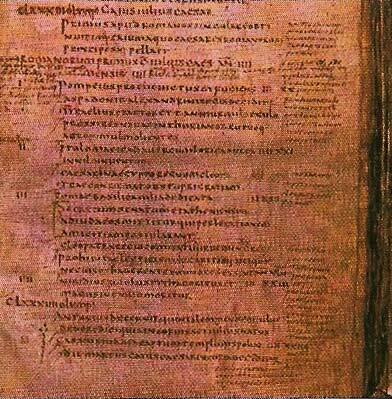 This Byzantine manuscript, dating from the ninth century AD, is written in Greek minuscule script, which ultimately derives from the cursive writing on the third-century BC papyrus. Figure 6. This manuscript is an example of Latin uncial writing and dates from the sixth century AD. The script is a rounded form of the capitals found in inscriptions; it was also adapted for writing on parchment manuscripts. It was in regular use from the fourth to the eighth centuries, but remained generally popular for headings and titles for considerably;y longer than this. Figure 7. Monumental capital (A) is the type normally found in inscriptions and resembles modern capital letters. It is from minuscule cursive (B), of the fourth century AD, that small letters originally derive. Carolingian minuscule (C) was a deliberate innovation of the period of Charlemagne (c. AD 800). Its clarity and simplicity won it acceptance as the script in regular use throughout western Europe. Twelfth-century Gothic minuscule (D) is sometimes known as black letter. The letters are basically in the same form as in Carolingian minuscule but have become more angular over the centuries with a considerable lost of clarity. Over the centuries humans have employed a tremendous variety of materials on which to write. Hard materials, mainly stone but also metals. were incised with a sharp instrument. Soft materials might also be incised, as were clay tablets in Mesopotamia (see Figure 1) and the wax-covered tablets of the Greeks and Romans (see Figure 2), but were more often written on with pen and ink or painted on with a brush. Leaves, bark, and textiles have also been used, although the principal materials were papyrus, parchment, and paper. The Egyptians were writing on papyrus as early as 3,000 BC and it remained in use as a writing materials for 4,000 years. Papyrus was made out of strips cut from the stem of the papyrus plant, one set being laid with the fibers running vertically and a second set placed on top with the fibers running horizontally. Pressure was applied to bond the two sets together to form a sheet and a number of these sheets were then glued to one another to form a long strip that could be wound into a roll. 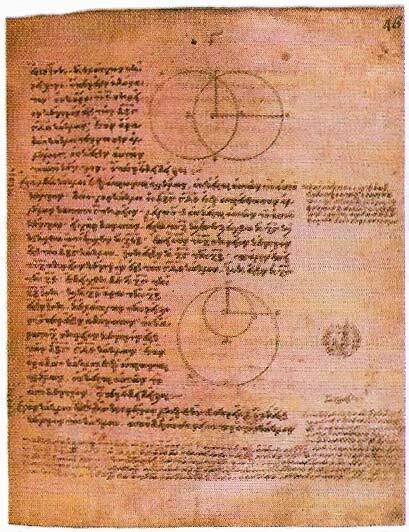 During the first four centuries AD the roll was gradually superceded by the codex. In this format several leaves of writing material (folios) were folded down the middle and then sewn to other sets or gatherings, in much the same way as most modern book are produced. 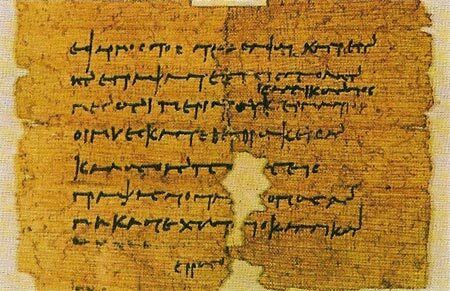 The new form began to predominate at the same time as parchment began to replace papyrus as the most common writing material. Animal skins could be prepared for writing by tanning, which produced leather (see Figure 3), or by tawing (soaking in a solution of alum and salt), which produced parchment. Paper is traditionally supposed to have been invented by the Chinese in the first century AD. The earliest paper was made of rag (paper made from wood dates from the mid-nineteenth century). The pens used in early times were normally made from reeds and the ink was carbon based using, for example, lamp-black. Later, metallic ink was used and, by the sixth century, quill pens. 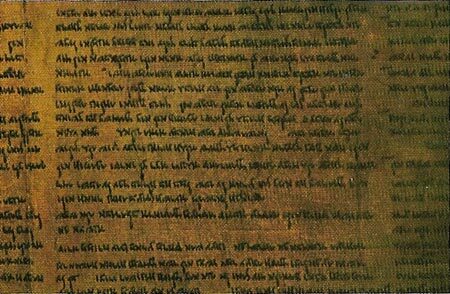 The decipherment of early scripts is obviously most difficult when the language is unknown and it generally depends on the discovery of a bilingual document with one text in a known language. Thus the Rosetta Stone, inscribed in Egyptian and Greek, enabled Jean Champollion (1790–1832) to penetrate the mysteries of Egyptian hieroglyphics and restore knowledge of a language that had been lost for 1,500 years. Similar bilingual texts made it possible to decipher Sumerian cuneiform. Even when such convenient documents do not exist, ingenuity can sometimes triumph. In the 1950s, Michael Ventris (1922–1956), using techniques learned while code-breaking during World War II, deciphered the Minoan syllabic script known as Linear B. Even when the language is known, considerable problems of decipherment remain, especially with examples on soft materials extending over several hundred years. Styles of writing naturally tend to change, sometimes radically. (An exception to the rule is Chinese, the calligraphy of which has remained essentially unaltered for some 2,000 years.) In Greek, for example, the development from monumental capitals to the uncial (rounded characters) of the early biblical manuscripts is readily detectable. But it is difficult to see any connection between these scripts and the cursive script with its typical flowing characters employed in a papyrus of the third century BC (see Figure 4), or between the latter and the minuscule, or small letter script, used in a Byzantine manuscript 700 years later (see Figure 5). The development of writing styles is to be seen at its most diverse in Latin script. In majuscule (capital letter script), the lettering of inscriptions of the classical period shows a clear connection with modern capital letters, a connection still easily seen in the rounded version (uncials) used in parchment manuscripts from the fourth century. However, the Latin script on papyrus and wood from the first two centuries AD (see Figure 8) bears little resemblance to our own alphabet, or even to the minuscule used for everyday writing from about AD 300. A direct descendant of this minuscule is the script known as Carolingian minuscule. 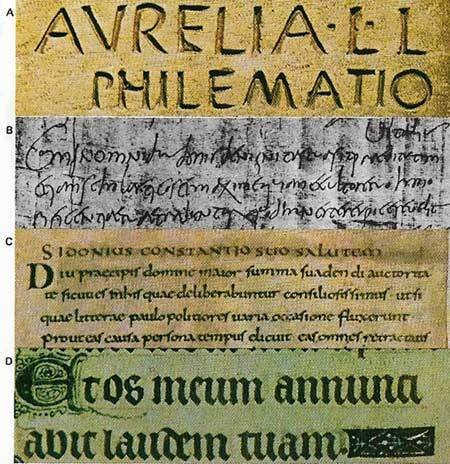 This simple and clear script soon became the accepted form for writing books throughout Latin-speaking Europe. At the same time it came to be written with increasing angularity, so that by the thirteenth century it had developed into Gothic or black letter script. Figure 8. 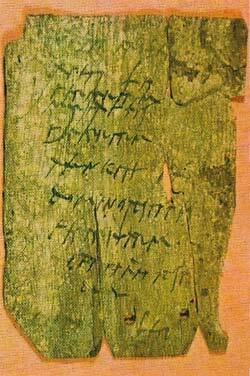 A Latin writing tablet from Vindolanda, a Roman fort in the north of England, record a list of military stores. It is part of a remarkable archeological discovery of wooden tablets written in ink, the first of which were unearthed in 1973. The script is the normal everyday Latin writing of the second century AD, descended from monumental capital but written much more fluently and rapidly. When printing was invented in the West, Gothic was the script employed for the first books. In Italy, however, fifteenth-century humanists reverted – in conscious reaction to Gothic – to a script based on ninth-century Carolingian and this was ultimately to become the universal script of western Europe (although in Germany this did not occur until the present century). A Carolingian hand, therefore, is immediately recognizable as being in essence the script of modern print. With the invention of printing the history of manuscript books ends, but styles of writing used in documents and letters continue to develop. The increasing literacy throughout the world has meant that today there are not just one or two recognizable styles of writing but countless individual and idiosyncratic variations.